Henry T. Segerstrom was a visionary, legendary developer and innovative philanthropist who brought business and culture to Orange County. Segerstrom’s vision, combined with his and his family’s generosity, led to the establishment of the Segerstrom Center for the Arts, a world-renowned center of culture and the arts. Learn more about this dedicated community leader at www.henrysegerstrom.com. 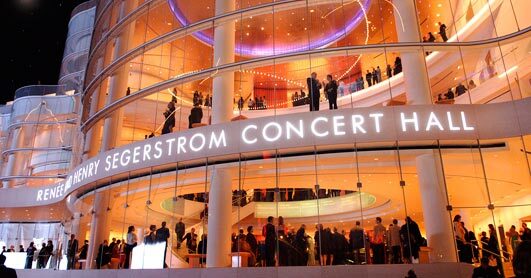 Segerstrom Center for the Arts is located in the heart of the Orange County Theatre District, just east of South Coast Plaza, on Town Center Drive and adjacent to South Coast Repertory. There are several parking garages adjacent to The Center. Exit Avenue of the Arts. Turn left on Anton Boulevard and right on Park Center Drive to the parking structure. Exit Bristol Street and turn left. Turn right on Anton Boulevard and left on Park Center Drive to the parking structure. Exit MacArthur Boulevard and turn right. Turn left on Main Street. Go two blocks and turn right on Sunflower. Turn left on Anton Boulevard. Turn right on Park Center Drive to the parking structure. OCTA can be reached on the web at www.octa.net and via phone at (714) 636-7433. The preceding number is for all OCTA information, including OCTA ACCESS service (disabled). The recommended parking structure for visitors to the Renée and Henry Segerstrom Concert Hall is the Plaza Tower Garage, located at the corner of Park Center Drive and Anton Boulevard, adjacent to the Westin South Coast Plaza Hotel. Google Map. Valet Service is available for a fee of $12 at Pacific Symphony's evening concerts of the Classical and Pops series for ticket-holders possessing a valid DMV-issued disabled license plate or placard. All guests will be asked to undergo a security inspection and have any bags, backpacks, purses or other like items searched before entering the Renée and Henry Segerstrom Concert Hall. We encourage you to leave personal belongings in your vehicle or at home. Your safety is our top priority and we don’t want you to miss a moment of the concert, so please arrive early to allow enough time to enter the building.